Former NHS professional Mary Duggan returns with her second blog post. Recalling moments from her role within the Healthcare sector, Mary shares her experiences, challenges and her methods to overcome the most difficult of business matters. Actually, this isn’t so much about creating a compelling vision as creating the engaging narrative that accompanies it. All of us have probably had the same experience of listening to a charismatic leader describing their vision for the future. It is exciting, it gets our hearts beating faster, we leave the room determined to make that vision happen. Then we sit down and think about it. That’s where it starts to unravel a bit, and the practical souls among us start to wonder what the vision actually means and what it might look like if it came about, and how would we know that we’d got there. I’ve certainly experienced that little heart-sink moment when I realise that although the vision sounded beautiful while I was listening to the inspirational presentation, once I’ve left the room I am no longer exactly sure what it means in reality. It is very hard to describe something that doesn’t currently exist in concrete enough terms for people to engage with it and make it happen. A while ago, I was involved in some exciting large-scale transformation work within an NHS Foundation Trust. We had planned a series of public transformation events where we would invite stakeholders to put some meat on the bones of the vision. We knew from past experience that presenting people with slides full of statistics and structure diagrams would not generate much creativity. One of my colleagues suggested that if we presented a set of stories that showed people where we thought we needed to make changes it might be more fruitful. Indeed, it was. We crafted half a dozen stories about fictional service users (though drawing on actual experiences) that described care that while not being terrible wasn’t good enough, either. They were short, to the point, and told in the first person. At the events, six people got up and narrated the stories. You could have heard a pin drop. The content that was then generated was powerful. So, what’s that got to do with Mind Maps, you might ask. We used the workshop content to generate some new stories that described the desired future state. Then someone pointed out that we didn’t have corresponding stories from the point of view of the staff who would be delivering the transformed services. We started trying to draft them but while it had been fairly straightforward to create service user perspective stories, it was much harder to get into the mechanics of how the services would actually be delivered. Imagine a future, say 5 years from now. The transformation that we are talking about now has come about and the changes are now part of normal working practice. What would staff be doing that is different from how they are working now? How might working relationships be different? How might this feel? What sort of things might happen between now and having a completed/embedded transformation? How might those events feel? Are there any places we don't want to go? The Map, with these questions, was projected for the group to see. People were invited to reflect on the questions and share their thoughts. A couple of hours of intense conversation followed. I captured comments and thoughts in the map as they were spoken – I made no attempt to sort or analyse. The group was able to see themes and patterns emerge for themselves and people were able to select which they wanted to explore in more depth. The end result was a rich and detailed picture of how both concrete working processes and more nebulous cultural issues would need to change, and the actions that would be needed to drive this. So far, you could argue that this was simply an electronic brainstorming process. One of the problems with brainstorm output is that it remains as a set of hastily written flip-chart sheets that lose clarity very rapidly. I suspect that when something is handwritten, it takes more of an effort to correct it or choose more effective wording, but when something is digital it can be edited quickly and cleanly. This encouraged the group to seek precision in what they were saying. The second important factor that comes into play is the ability to use the analytical tools that MindGenius offers. The group discussion had already highlighted some themes, which were used as the analysis categories. It took a short time after the group to categorise all of the comments, sort them into category groups and re-present them to the participants as a coherent and powerful narrative. The unexpected part of the experience for me and for the group members was how exiting and moving the process was. The group quite literally saw their vision take shape in front of them. Look out for Mary's third blog post coming soon. It’s almost time to down tools, abandon your desk and enjoy this season’s festivities but before then, have you planned ahead for 2015? Mapping out tasks, priorities and deadlines provides the ideal format to capture, sort and categorise your own or your team’s workload. The mapping exercise allows you to visualise everything and arrive at decisions on workload levels, importance, priorities and what needs to be delegated. Additional functionality enables categorisation, allocation of resources and timescales, filtering and other mechanisms for tracking and reporting. We all subscribe to the adage that “failing to plan is planning to fail”. The use of mind mapping software to organise objectives, tasks and general workload really does help you to plan, organise and work smarter to be that bit more thorough, efficient and effective. The area of Project Management covers a wide and varied spread of project types and sizes – from relatively small projects covering short timescales, through to complex multi-faceted projects involving many people and covering months, sometimes years of work. The size, type and nature of any project will dictate the amount of time, resources, methodologies and processes. Our experience and research indicates that, regardless of size and type, many projects fail due to poor or inadequate planning. This is the pre-scheduling stage, the crucial up-front capture of the project requirements and the project work breakdown structure (WBS) – the stage that everything else hinges on, where if important aspects are missed; project success is potentially placed under immediate risk. The use of mind mapping software to brainstorm, capture and structure the all-important up-front project WBS enables planning to be better focussed and effective. This highly visual way of capturing project data is engaging and more naturally suited to this process than traditional static, linear methods such as schedules and spreadsheets. More often than not we are required to research or examine and evaluate lengthy or complex pieces of information. It is that sense of being faced with a mass of information to interpret it and make sense of it all that can sometimes be a daunting prospect. Mind mapping software saves us time and a whole lot of effort in the way we can capture key words and phrases and quickly de-clutter chunks of information. The visual aspect appeals to the way we naturally “chunk” information to reduce complexity and gain better insights into what it all means. The fact that we can group, move, sort, colour-code, categorise and/or filter on mapped information gives us various options of working with and interpreting information quickly, effortlessly and in a less labour-intensive way than some traditional methods. In practically everything we do, we almost subconsciously take our ideas and knowledge through an information journey process – capture, understand, analyse and decide. We all embark on these information journeys continually in most of our business activities. We don’t always process ideas, creativity, knowledge and experience in the most effective or efficient ways, the result of which is misunderstandings, misconceptions, missed opportunities and missed deadlines (to name but a few!). Too many times we miss things; we don’t utilise our creativity as much as we should; we’re not thorough enough; we don’t have the right tools and techniques for thinking things through. Mind mapping software is one of the best enablers for visualising data and facts. We can take any problem or opportunity and run it through any technique that involves drilling into the detail of who, what, where, why, when and how? Mapping is an excellent way of brainstorming, idea generation and generally capturing knowledge, experience and creativity. With a career spanning over 30 years in healthcare including front line work as an Occupational Therapist and more recently within Lead Service Improvement, Mary Duggan recalls the significance of mind mapping software within her role. Through her years of experience, Mary adapted her tools and approach in order to achieve a more productive and intuitive way of working. Recalling a particular moment in her career, Mary explains just how much mind mapping software revolutionised her role. Service improvement is generally seen as a systematic approach that walks people through the stages of assessment, diagnosis, problem definition and solution generation. That's how we like to think about it anyway. It is as comforting as the London Underground map - logical and straightforward to follow. Many of us will recognise that it also bears as much relationship to the real world as the London Underground map does. The process is a useful guide, but at some point you have to involve real people and real-life complex and messy situations. Then the dissimilarities between the map and the territory begin to appear. Many years ago, I was working in a service for older people with mental health problems. We were fairly sure that we could be using our resources more effectively. As part of the initial assessment and diagnostic stage, I arranged to interview a group of men whose wives all had dementia and were receiving services from us. I had a well-constructed question set all ready to go. Within the first minute of the interview, it all started to fall apart. I asked the first question. One of the men replied "I'll tell you how it's been..." and began to tell the story of his experience. I tried to draw him politely back to the question. He ignored me equally politely and carried on with his story. I bowed to the inevitable and listened carefully as he and his companions told me what it had been like to see their wives struggling more and more with everyday life and their experience of trying to get help. As they ended their stories, I realised that they had answered all of my questions, naturally and eloquently. Most importantly, they knew that their stories had been heard. I wasn't using mind-mapping back then. I had to spend a considerable length of time transcribing a tape recording of four men with very broad West Yorkshire accents. Then I had to try to sort their answers into themes. I got there eventually. Just a few weeks ago, I did some work with a team who were concerned about the end-to-end time that their referral to admission process took. They provide a rehabilitation service for people who need longer-term support to regain their independence. There was a general feeling that the process was lengthy and cumbersome. The team had specifically requested support with some lean techniques. We had done some initial data exploration which seemed to be telling us that apart from a few outliers, the process generally took an acceptable length of time. So what was the problem? They wanted to map the process because there were aspects of it that they were still not happy about and wanted to find a way to articulate this. I turned up to the next session, armed with huge sheets of paper and packs of sticky notes. They sat and regarded the blank paper thoughtfully. Then they began to talk about the process and how they experienced it. The conversation was free-flowing and divergent. I already had my laptop connected to a projector, so I suggested that we used a mind-map rather than a process map. This let them continue with their exploration of the issues with the added benefit of seeing the mind-map build up as they spoke. They began to make some very interesting points about the underlying dynamics of the process of trying to find a good plan of care for individuals who may be quite chaotic and who certainly don't fit neatly into any pigeon-holes. This can create significant levels of anxiety among the people who are trying to support them, and this anxiety easily rubs off onto processes. The conversation moved away from “how can we speed up the process” to “how can we take some of the anxieties out of the process”. This required a very different approach from eliminating waste and work-arounds from a process. It helped the team realise that they needed to work on helping their stakeholders to understand the process, and that to do this they needed to use the right language to help people to understand the part they play in that process. Working with mind-maps is a great way to harness free-flowing conversations. In my experience, this is usually the best place to start. Then, having heard the underlying story, you are in a good position to select some more structured diagnostic tools. You will be using your toolkit with precision and intentionality. It isn't difficult to create templates for many of your favourite diagnostic tools. If you check out the Problem Solving section in the built-in templates in MindGenius, you will find that there are some there already set up for you such as 5 whys, cause and effect and key questions. An added advantage of using a mind-map as your starting point for service improvement activities is that even at the earliest stage, you will find people identifying potential actions. You are well aware of the dangers of leaping into solution generation before properly analysing the situation, but there is that natural human impulse to offer solutions. Mind-mapping lets you have your cake and eat it. You can create a dedicated branch in your map for actions. After exploring the story of the situation and running some diagnostics, you will be able to see which of those actions are worth pursuing. It's the work of seconds to then drop them into an action planning map. Our friends over at Biggerplate have launched a new initiative which will see the mind map library focus on a particular subject theme each month. For the month of October, the team have been focussing on Productivity and encouraging all users to share their own productivity maps. Head over to Biggerplate and check out our latest and most productive maps yet! 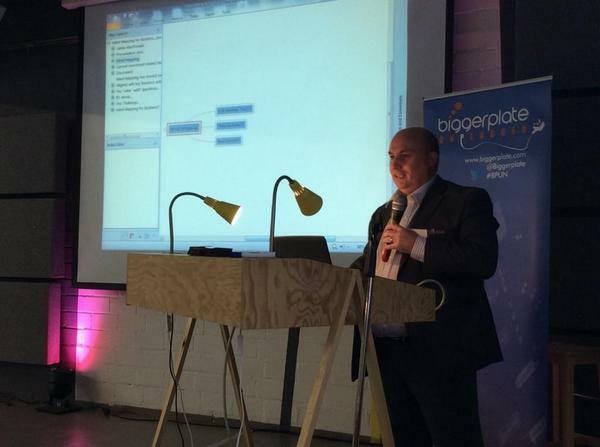 Earlier this month our Head of Client Development, Jamie MacDonald attended Biggerplate Unplugged alongside other developers, consultants, bloggers and mind map users, in the wonderful City of Berlin! Attending the Biggerplate event as a speaker and discussing the integral use of mind mapping in business Jamie also enjoyed taking part in discussions and interactive sessions with fellow attendees! Interested to hear what Jamie had to say? Stay tuned on our social media channels for the release of the recorded footage from the day! There are many skills a person requires to be successful in their business life. It is hard to decide which skills are more important than others, but one could argue that it depends on each individual, their job role, aims, goals and other personal and situational factors. However, I am sure that we would all agree that one of the most important skills, one which is inbuilt into our very being from the moment we’re born, is thinking skills. Peter Drucker, the world renowned management consultant, educator and author, is credited with introducing the concept of “knowledge worker”. This term has been debated and argued about for decades now and has many diverse definitions. However, generally the term is used to describe people at all levels whose work involves problem-solving, analysis and decision-making. Research indicates that “knowledge workers” in the main are the ones that come up with new ideas around innovation, new processes, new ways of working, new products, services and so on. Research also points to two main skills of a “knowledge worker” - effective communication and thinking skills. “Is that not all or most of us?” I hear you say. When I think about it, if you were to take a walk around most of todays business premises, I would suggest that you will find a “knowledge worker” at most desks, huddled around meeting tables, on calls to customers, chatting at the water dispenser, talking in the corridors, in discussions with bosses and colleagues – it seems most of us are indeed employed to be that “knowledge worker”. Without getting involved in a deeper debate as to what or who a “knowledge worker” is, I am comfortable with the concept of that type of person needing to be an effective communicator and also possess excellent thinking skills. In my opinion thinking is one of the life-skills which is central to being an effective worker-contributor, regardless of vocation or role. 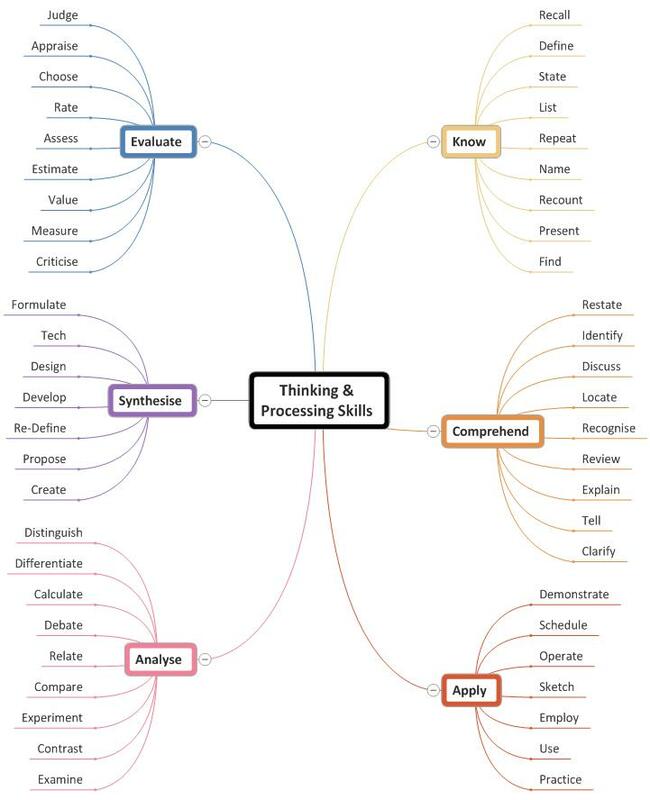 We could include skills associated with processing information and data under the “thinking skills” umbrella. If we were to reflect on the above skills and match them against the skill requirements for our own roles, key responsibilities and functions, and if we were to consider for a moment the practical day-to-day application of these skills (as indicated in the map above), I dare say we would be ticking a lot of them off as applicable to us personally. 1. Surely we should be seeking to recognise the thinking skills we have and map them against the ones we need to fulfil our role and responsibilities? 2. Should we not be open and honest (and dare I say realistic?) about identifying skill gaps and opportunities to improve on those thinking skills? Entering into a fuller discussion on the above aspects would necessitate more editorial space and more of the readers’ time to read and digest (I simply cannot afford either luxury! ), so allow me to touch briefly on the latter aspect – tools and techniques for equipping us as “knowledge workers” to deploy our thinking and information processing skills to best effect. To qualify “best effect” – to contribute to “Know / Comprehend / Apply / Analyse / Synthesise / Evaluate” processes (above) in ways that increase efficiency, effectiveness and productivity within our own role and our overall contribution. 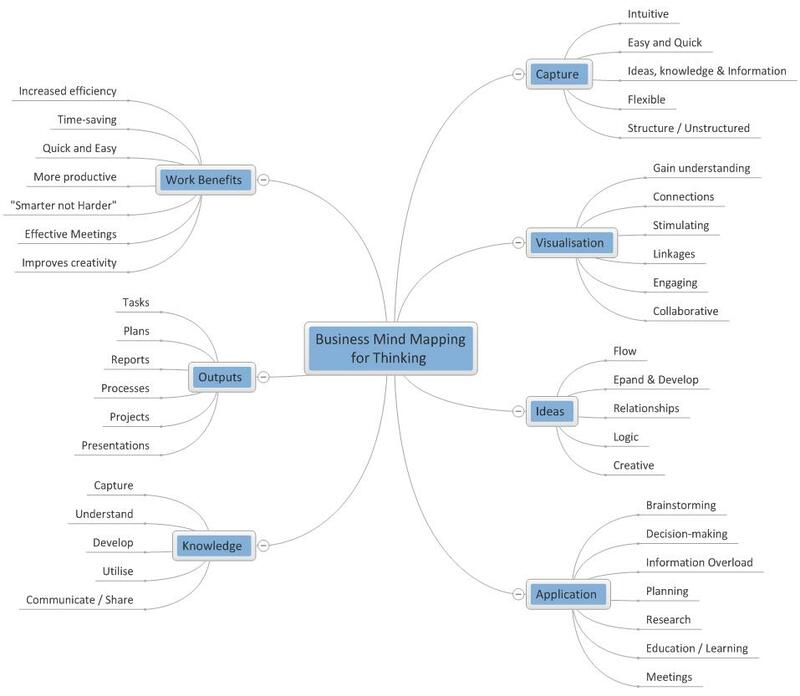 If the experience of using mind mapping in business and education contexts (not to mention the many years of experience of helping clients in a variety of disciplines) has taught me anything, it is an impressive proven methodology for enabling, improving and boosting the thinking processes. I have heard the “excuses” of “I don’t think that way”, I’ve been tackled on the “right brain v left brain” concepts, I’ve even had the “mind mapping is for geeks” joke…. However, for me, if we open our minds, put age-old preconceptions or misconceptions to one side, what business mind mapping, specifically mind mapping software (such as MindGenius) offers, is an intuitive, creative, and highly visual “virtual whiteboard” to capture your thinking. This is explicitly our thinking around any topic, initiative, plan, problem, opportunity, project and any other daily task or activity requiring clarity and focus in the all-important upfront thinking stage. Also, it is about adopting a platform that allows you to drill into sufficient detail, see patterns, themes and linkages, gain better understanding and give you a springboard to better prioritisation and well-informed decision making. Even if we took advantage of this increased efficiency and productivity just for the upfront thinking stage, it is also worth highlighting that modern business mind mapping tools then propel our thinking into other productive outputs – prioritised plans, task management, project scheduling and reporting, documents and reports, presentations and so on. It is no wonder that millions of people globally are taking advantage of business mind mapping and giving themselves a considerable edge over those sticking to alternative, manual, static and less creative traditional methodologies. You may be thinking that I’m labouring this point, but just consider for a moment how something so natural, so organic, so taken for granted – the thinking process - can sometimes be the very rock on which problems, solutions, innovation, and even the way we communicate with others, founder and break up on. I wonder if it’s because we don’t take the thinking process seriously enough? I wonder if it’s because we think we can be heroes all the time by getting to solutions and finishing work and projects quicker? I just wonder if sometimes we could have prevented errors, mistakes, broken promises, failed deadlines, etc, just by taking time to “think things through thoroughly”? To be that well-rounded, truly effective “knowledge worker”, we must seriously consider adopting such a proven and specifically-designed “toolkit” to help us really improve the way we apply our thinking – business mind mapping – think about it! Author Bio: Jamie MacDonald, Head of Client Development at MindGenius. He is a highly experienced trainer, facilitator and coach with over 20 years’ experience in training, organisational development, HRM and performance improvement. Jamie specialises in the application of MindGenius business mind mapping software as a catalyst for enhanced personal, team and organisational performance and productivity. A Mind Map is a graphical, visual, mapped representation of ideas, knowledge and information. It enables you to think and organise your ideas in highly visual, creative and engaging way. Typically, the layout is hierarchical, starting with a central idea or topic and all associated ideas connected and radiating out from the centre. In a studying, learning or information-gathering situation, as an example, start with your central topic or subject and then organise your thoughts and associated knowledge around it. 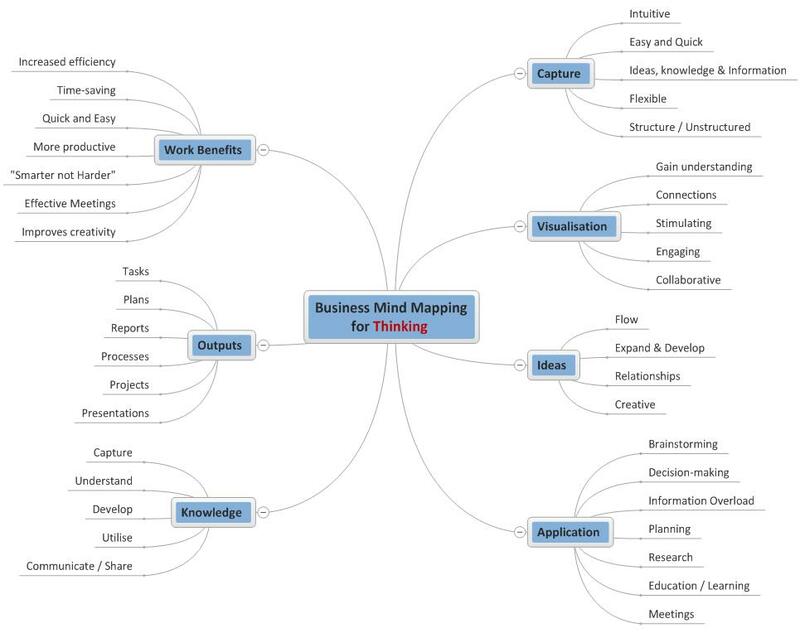 Mind mapping is a fluid, visual way of capturing notes, ideas and knowledge. As the map builds, its structure and layout provides a layering of the subject matter, from an overview around its first level, then drilling down and expanding out into hierarchical details of the topic and sub-topics. This enables students to gain a better understanding of the subject matter and allows them to add new ideas, identify connections and relationships. The use of colour and imagery also adds to the mapped information and helps with retention and recollection of facts. Mind mapping is used universally by people in all walks of life, particularly by students, to capture knowledge ideas and information. In addition to use for studying and learning, mind mapping is particularly useful to organise thoughts and ideas when planning and writing assignments or project work. For clarity and focus on information that needs to be explored and clearly understood, the mind mapping methodology allows you to identify links, themes and relationships – enabling a focussed approach for analysis, prioritisation, problem-solving and clear, well informed decision-making. Mind mapping is a very useful learning tool to help students in any learning environment with their thinking and understanding of any given topic or subject matter. Whilst the origins of mind mapping are based on drawing and utilising mind maps on paper, visual mind mapping software tools (e.g. MindGenius) have greatly automated and enhanced the whole process. Mind mapping software brings a decades-old methodology firmly into the 21st century and enables a more visual, effective and more function-loaded way of building, manipulating, analysing and working with knowledge maps. Students using mind mapping software now have access to a whole new world of creativity and are able to create highly visual maps, work easier and more efficiently with large amounts of information, handle complexity and are able to gain better understanding of information and produce outputs of a higher standard easier and quicker than ever before. In addition to this, mind mapping software packages now integrate with MS Office and other applications for converting maps to other outputs such as MS Word documents, MS PowerPoint presentations, project plans, etc. 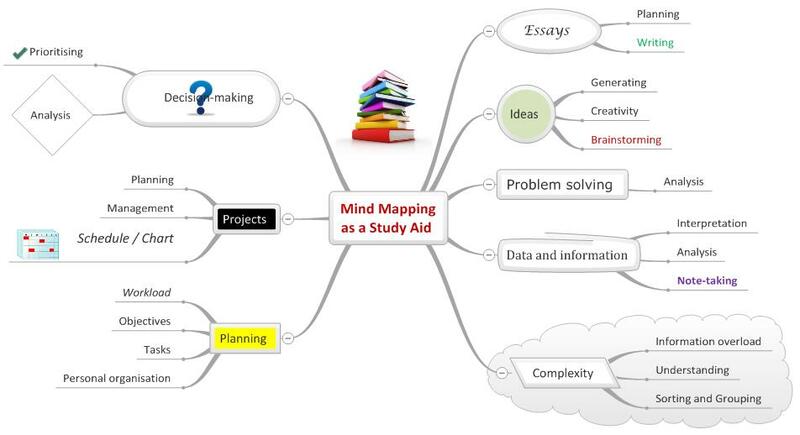 The length and breadth of uses of the mind mapping approach for learning and studying is vast. It is also worth highlighting the great use and value in mind mapping in the Assisted Learning environment. In most cases, after we have captured and mapped a mass of ideas, knowledge and information, we need to re-structure our map in order to aid understanding and bring focus and clarity to the exercise (e.g. we may need to clarify areas of complexity; we may need to prioritise; or we may need to reach decisions and or outcomes). Re-structuring of a map is achieved by moving branches either in order or sequence within the same level, or moving into different levels and parent/child relationships. How Can I Move Branches and alter the Map Structure? Re-structuring a Map and grouping is a highly engaging and beneficial collaborative exercise for a group/team to actually carry out. It encourages communication, aids understanding and the end-result is a more focussed, clearer outcome. Whatever methods and MindGenius functionality you use, the key point is that clarity and focus on any complex topic or subject matter can be simply achieved through Map re-structuring. 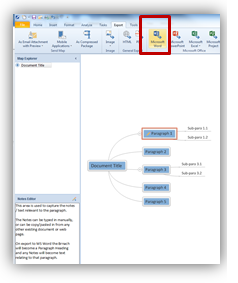 Help on moving and re-positioning Branches is available within the MindGenius Help content area in the “Tools” Ribbon. 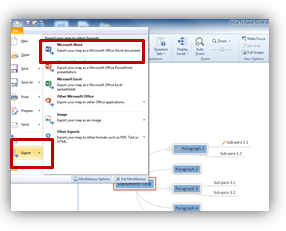 MindGenius provides the ability to export a Map to MS Word. This function is particularly useful when preparing a document, article, briefing, report or assignment. Where will I find this export function? Tip for best results: The default settings will give good results on exporting a Map to MS Word. MindGenius provides a selection of pre-installed Question Sets. Question Sets are available for a range of subjects and purposes such as strategy, planning, essay writing and writing a business plan, among others. Question Sets are key questions on a range of subjects designed to help you explore that topic more fully, and help you build your map quicker by prompting you with key questions that help to ensure a thoroughly explored topic. They also ensure your map is well structured and stays on track. Question Sets also help you get the most out of your Template maps. You can also create your own customised Question Sets. Where will I find and select Question Sets? How Do I Create My Own Custom Question Sets? Where Can I Find the Branch Format Functions? The formatting functions are located on the Format ribbon. Font properties of branches are changed via the Font command group on the Format Ribbon. This includes Font type, size, foreground and background colour. Branch shape and Fill colour can be customized through the Branch Appearance command group. (From the Branch Shape tab of the Branch Appearance dialog you can change: Branch Shape; Line Style; Line Width; Fill Colour and Boundary Colour). In MindGenius colour can be used to enhance the meaning of a map as well as to help it look good. Colour, for instance, can be used to code or categorize a map after a brainstorming session, to make a particular part of the map stand out or to create an association to aid memory. Branch connector type and styles for the whole map are set via the Connector Type menu on the Format Ribbon. Auto-colour is used to highlight each thought-path in your map by assigning a different colour to each Level 1 branch. Auto Colour is turned on and off via the Auto Colour toggle command on the Format ribbon. The spacing MindGenius places between child branches and their parent and between sibling branches can be adjusted. The horizontal or vertical space between branches can be increased or decreased. The style of a branch can be copied and applied on to other branches in your map. Branch styles are pasted via the Paste Style command on the Home Ribbon. Each time I take a look into our customer base profile to gauge the depth and breadth of MindGenius use and adoption, I can’t help but be amazed at the range of age groups, job roles, work disciplines, application, uses and benefits. Recent discussions with a colleague around this issue challenged me to pause and think “beyond the product” about the wider, bigger picture around the dynamics of what is actually taking place in our customer base. • Brings clarity and focus to tasks, activities, etc. However, it could be argued that whilst important and impressive enough, that list could be interpreted as high level and quite general. If we scratch below the surface, we start to uncover some real and telling uses and benefits – ones that really impact on individuals and groups and contribute to wider and far-reaching benefits. What we see happening is when users engage with the combination of the MindGenius functionality and the mapping methodology, it becomes an intuitive and effective “way of working” that provides visualization, clarity and focus that alternative linear, static and less creative and engaging methodologies simply do not provide (in fact have the opposite negative effect). So, whether you are young, mature, in education, in business, office based, in management / leadership, or whatever, the MindGenius approach will augment your own skills and approaches, and in most instances help you noticeably improve them. Going back therefore to my original viewpoint of “beyond the product”, the use and adoption of the MindGenius methodology simply improves the way we tackle these everyday tasks, activities, challenges and plans, etc. The map diagram above is a quick brainstorm of the various areas we can prove the impact as a result of some of the ways our customers apply MindGenius. These areas are vital Life Skill aspects. Think of how many times you, or someone you know, at home, in education, or in business need to display or even improve on these Life Skills… if our research and customer feedback highlights real and tangible benefits and results in each one of these areas / skills through the use and application of MindGenius, we surely cannot afford to miss out on availing ourselves of the opportunity to further improve the way we work, perform and generally apply our personal armoury of Life Skills? 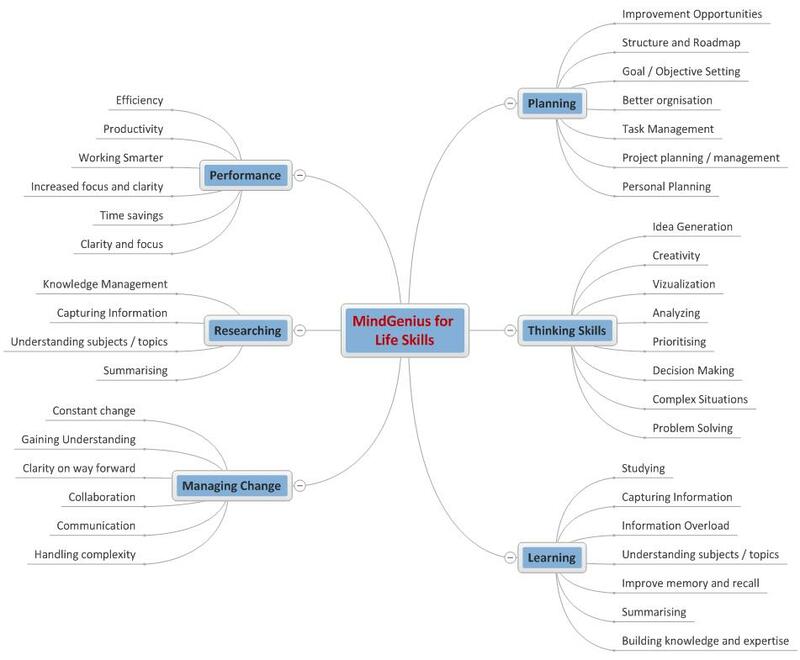 If you feel you are possibly not getting the best of MindGenius in these all important Life Skills, or you know someone who could benefit from being introduced to or increasing their use of MindGenius, we have the experience, knowledge and practical Know-how to help – just get in touch – we’d be delighted to hear from you! We also provide advice and professional training and consultancy services to help you get the most out of MindGenius and its applications for many personal, business and education uses. Author Bio: Jamie MacDonald, Head of Client Development at MindGenius. Jamie is a highly experienced trainer, facilitator and coach with over 20 years’ experience in training, development, HRM and business improvement.